I really like this gorgeous Orangy Chaniya Choli. These days, my only job is to look for some great Indian dresses because my marriage is just around the corner. Thanks to you shilpa, I came across such a wonderful Website. Their products not only look promising but the best part is they are pocket friendly. Thank you so much for hosting such a beautiful giveaway !! Hope to win my favourite lahnga choli for navratri dandiya. Hope to win mt favourite lahnga choli for navratri dandiya. Fell in love with this trendy and classy dress.. In love with all outfits but have to choose one so i choose this. ➡ Fell in love with this trendy and classy dress.. Followed on all platforms dear team.. Following alive N Kicking & emegamartindia on all plateforms. My Instagram id is :- @priti9747 & Twitter id is @pritigupta13031... kindly check .. I followed all terms & conditions . Firstly, thank you so much for the awesome Giveaway! 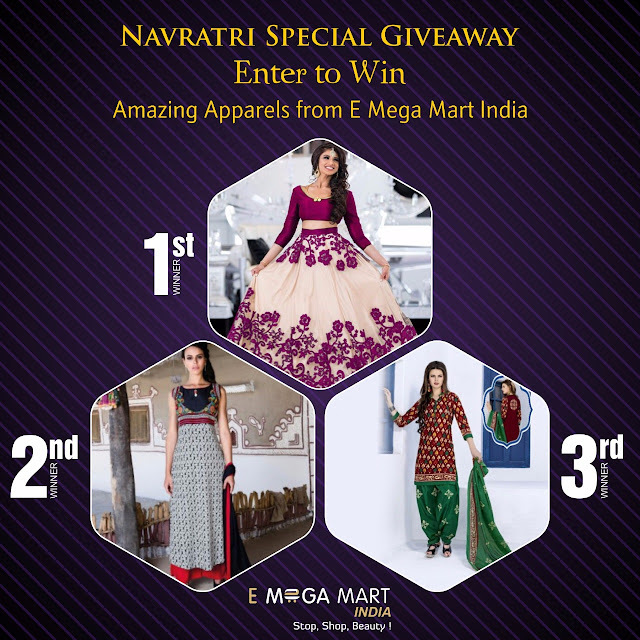 The Website, you has introduce to us, 'E Mega Mart India' is just awesome! When I went to search the website; I was really amazed and got puzzle, because every product is so beautiful and elegant there!‏ After cultivating all the dresses, I have found my most favourite dress, and it is - 'Designer dress material with digital dupptta'. I really love the color combination of this piece. Thanks again for the awesome Giveaway. Stay happy and blessed. Happy Navaratri. I found my favourite Bandhej Lehanga Choli.. Badly in love vd it. Following alive N Kicking & emegamartindia on all plateforms.